Republican anger over Jonathan Gruber’s Obamacare comments is justified: Democrats used the MIT professor’s words to attack the GOP first. The Oracle of Obamacare in the flesh. If only Halloween hadn’t passed, someone could go as MIT’s Jonathan Gruber. He is the economist most likely to get people in Washington to run out of a room. At the moment he is a problem for the Obama administration and Democrats, though he’s spooked Republicans before, too. At an academic panel in 2013, Gruber said of the Affordable Care Act: “This bill was written in a tortured way to make sure” the Congressional Budget Office “did not score the mandate as taxes.” He also said that “lack of transparency is a huge political advantage,” and added, “Call it the stupidity of the American voter or whatever, but basically that was really, really critical to getting the thing to pass.” The video has surfaced now and conservatives are pointing to the admission as more proof that the Obama administration, which came to town pledging new levels of transparency, was trying to hoodwink voters with the Affordable Care Act. Gruber has now distanced himself from his remarks. “I don’t know who he is,” House Minority Leader Nancy Pelosi said Thursday, although she has referred to his work in the past. “He didn’t help write our bill.” Democrats are saying that Gruber was only one of many advisers and that the $400,000 he was paid by the government was simply for his economic model. This reaction looks like panic to distance Democrats from Gruber, which is impossible. It’s impossible not only because Gruber says he helped with the law and visited the White House five times in 2009 to help craft it, but also because the Democrats were the first to use the MIT professor as a political weapon. Before he was causing problems for the Obama administration, the Obama team was using Gruber to unsettle Mitt Romney. In the 2012 campaign, Obama’s camp was claiming that the Massachusetts health care plan was the intellectual model for Obamacare, just as Romney was trying to disavow it. Gruber was essential to this case. In a video produced by the Obama campaign celebrating the anniversary of “Romneycare,” Gruber says, “I helped Gov. Romney develop his health care reform or Romneycare, before going down to Washington to help President Obama develop his national version of that law.” The spot includes old footage of Romney thanking Gruber for his work on the Massachusetts health bill. 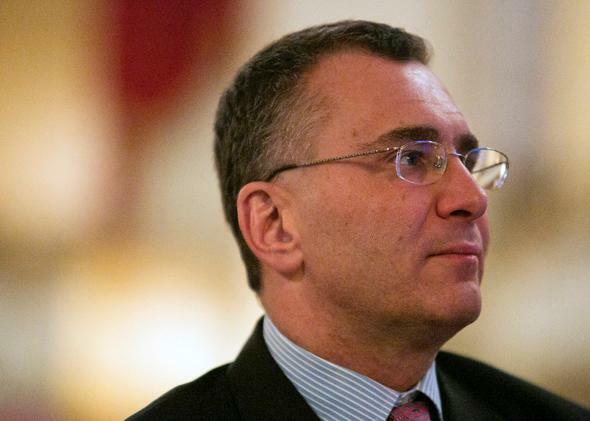 “The core of the Affordable Care Act or Obamacare and what we did in Massachusetts are identical,” Gruber says. The MIT professor was such an important part of the creation of Obamacare that his association with Romney’s effort proved the link between the two programs. If that involvement in Obamacare was sufficient to condemn Romney in 2012, it’s sufficient enough for Republicans to raise it now over Gruber’s claims about the Affordable Care Act. What’s Gruber for the goose, is Gruber for the gander. Gruber’s name came up earlier this year in another skirmish over the law. In yet another talk, he suggested that the Affordable Care Act was written so that states that didn’t set up insurance exchanges would not also get tax credits. “If you’re a state and you don’t set up an exchange, that means your citizens don’t get their tax credits,” he said. (He since has said that he was speaking off the cuff and didn’t mean to say what he said.) That’s a key argument in the Supreme Court case against the law in which plaintiffs argue that the subsidies that go to states with federal exchanges are illegal. More Gruber remarks are coming out. Jake Tapper reports on CNN of another instance in which Gruber said the authors of the law mislabeled provisions to make them easier to swallow. One possible defense of Gruber that can be made is that he was merely describing a truth both parties know: that in order to achieve policy objectives, laws have to be written in convoluted ways to avoid political traps, including a politically bad assessment from the Congressional Budget Office. Also, what Gruber describes was a part of the open policy debate surrounding the law. That would return a conversation that is about duplicity back into one about policy differences. The law wasn’t trying to fool the American people, just the Congressional Budget Office. But that’s not much of a case. Given how often the administration has used the Congressional Budget Office as metaphysical guarantors of truth, this argument just lands you back into hoodwink territory. If the Congressional Budget Office is an institution of such solemnity, why would you want to trick its analysts? The better defense is the one the White House is giving, which is that millions of people are now covered by the law and they seem to like it. As Republicans try to dismantle the Affordable Care Act from their new position of power in Congress, Gruber will become an oft-cited Oracle of Obamacare. But he confirms a broader critique conservatives have of the president, which is that he either cynically thinks people can be fooled or he thinks people aren’t smart enough to know what’s good for them. That means we’re likely to hear Gruber’s name in debates over issues like immigration, in which he has played no role at all.